Steve McCowen, Vicksburg Chamber of Commerce chairman. 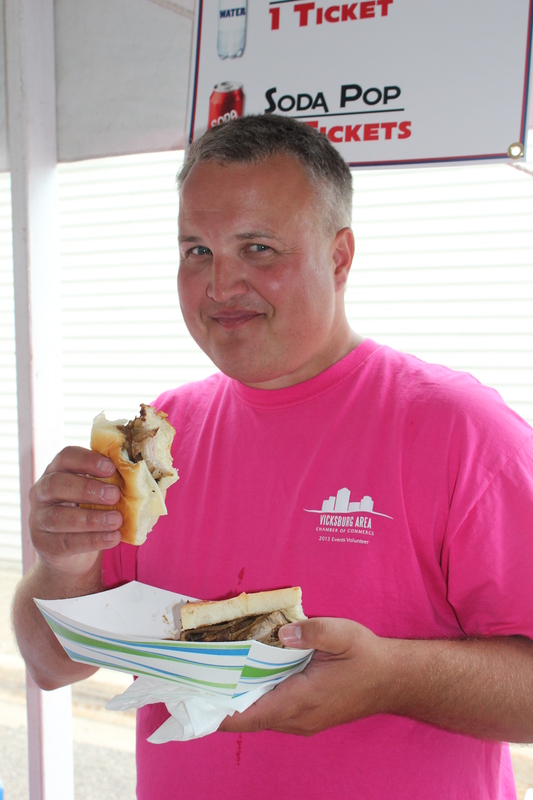 The second annual Taste of Vicksburg, to be held Saturday, June 28, promises to be even bigger than last year’s event which attracted between 2,000 and 3,000 people, according to the event’s sponsor, the Vicksburg Area Chamber of Commerce. Steve McCowen, Chamber president, said organizers have planned attractions to appeal to many different kinds of taste, from food and beverage to art and music and style. The heart of the Taste is, of course, food and drink. This year, 11 local food vendors will be stationed at tables along Prairie Street from 3 to 7 p.m., with each table offering a house specialty. Tickets for food samples will be available at three downtown locations. And the ever-popular beer tent, on Prairie Street in front of the Hideaway, will be open from 3 to 11 p.m.
For art lovers, Taste of Vicksburg is ready to please. An Art Hop will be staged along Main Street from 3 to 8 p.m. with about 15 local artists showing their work. The Little Bulldogs Learning Center staff will host games for children in the closed-off street in front of the artists’ displays. If your taste is more toward personal appearance, you can even get a haircut from 1 to 5 p.m. Trimming locks on the corner of Main and Washington Streets, volunteer stylists will charge $10 for haircuts, with all proceeds going to raise money for uniforms for the Vicksburg High School marching band. The event is also prepared to pamper your musical tastes. Taste of Vicksburg 2014 is hosting Dani Jamerson and her popular country rock band from 6:30 to 8:30 p.m., and the David Shelby band, from 9 to 11 p.m.
Shelby, who describes his sound as “Rust Belt Country,” says it melds the rock-and-roll history of Detroit with the country sound of Nashville. His debut album, “Rust Belt Cowboy,” released in 2013, has been hugely successful. Proceeds from last year’s Taste of Vicksburg were used by the Chamber to finance local projects, including its new website and equipment for the Halloween Haunted House, said McCowen. For more information about this year’s Taste of Vicksburg, visit vicksburgchamber.com, or e-mail connect@vicksburgchamber.com. Taco Bob’s, 108 W. Washington St., is the home of the Funny Taco. If you’re wondering what that is, it is a crispy corn shell taco wrapped in a warm, soft tortilla with nacho cheese between the two shells. It keeps all the good stuff inside when you take a bite. Taco Bob’s has several different varieties of tacos, including the “walking taco” which is all the goodness of a taco in a cup, a great idea for when you’re on the go. They also have tostadas, quesadillas, nachos, salads and burritos. Taylor Bowen and his dad, Todd, purchased the Vicksburg location in July, 2013. They maintain a commitment to welcoming their customers as family and getting to know their regular customers’ names and their orders. Their product is quick and cheap, and keeps people coming back for more. Everything in the store that can be homemade is. The beef is brought in every day and a secret recipe is used to make the taco meat. The chips are made fresh every day and they make their own salsas, from the chunky mild to the extreme. 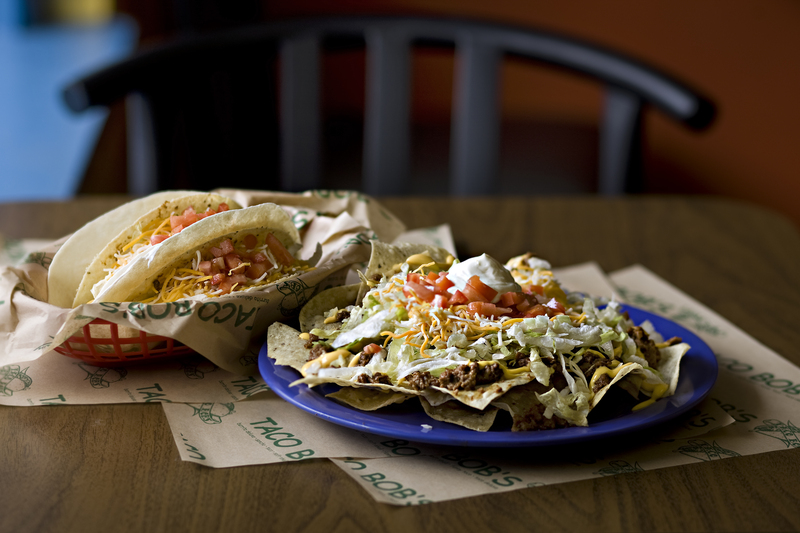 Pictured are two funny tacos and nachos supreme. Taco Bob’s hours hours are Monday through Friday from 11 a.m. to 7 p.m.; Saturday from 11 a.m. to 3 p.m. and they are closed Sundays. Their phone number is 269-649-9514. 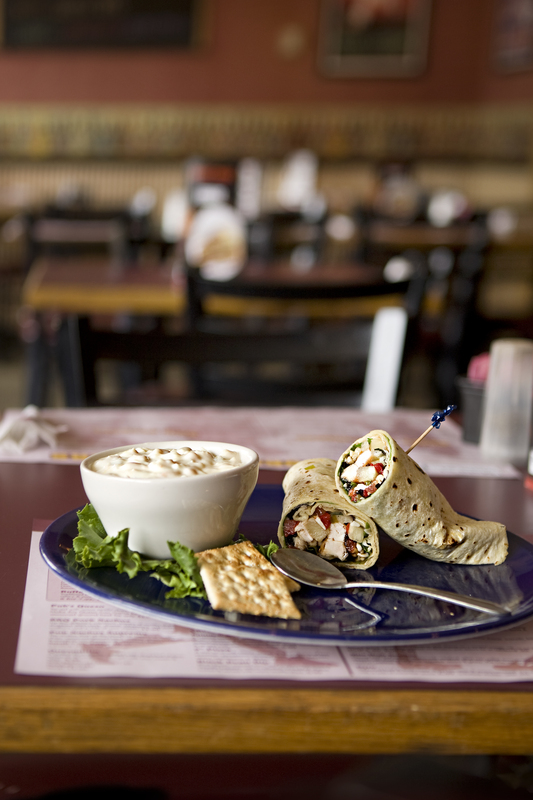 White chicken chili and Caribbean Chicken wrap. Built about twenty years ago, the Main Street Pub, 208 E. Prairie St., in Vicksburg is one of several in the Kalamazoo area, although each location has something different for everyone. Whether for lunch, dinner or late night snacks, it is a favorite spot with local residents with many people stopping by after local high school sporting events and school activities. Low prices and a wide variety of items on the menu bring people in. It’s a friendly, fun environment and chances are you’ll see someone you know. The regulars enjoy a full bar as well as daily food and drink specials. The jalapeño poppers, pretzel bites, sweet potato fries and nachos are several of the favorite appetizers on the menu. Although the big winner on the menu is the chocolate lava cake. As a neighborhood hangout, there are dart games and video games on hand to play, and always something to watch on the many TVs in the bar and dining areas. A large room is available for meetings or larger groups. The Caribbean chicken wrap and white chicken chili looked and smelled wonderful. You will find many different appetizers, sandwiches, soups and salads at Main Street. Burgers include an olive burger, bacon ranch burger, the Bronco, Cabo Beach burger and many more. If you want to try something different, the Hornet wrap has crispy chicken tenders, shredded cheese, avocado, pico de gallo, mixed greens and chipotle ranch rolled up in a warm wrap. Or you could try one of several main dishes, such as the pot roast or a pasta dish. Main Street’s phone number is 269-649-5903. Hours are Sunday through Wednesday, 11 a.m. to midnight, and Thursday through Saturday, 11 a.m. to 2 a.m. Take out and outdoor seating are available. At Rise N Dine, 121 South Main Street in Vicksburg, Deb, Jake or one of the servers will say, “Sit wherever you like,” emphasizing the family atmosphere. The great big smiley face rising sun with the sunglasses over the front door tells you it’s a friendly place. John and Deb DeBault and their sons, John and Jake, own and operate Rise N Dine. After a lifetime in the restaurant business, they opened Rise N Dine right after Thanksgiving, 2012, and the regulars will agree it’s been going strong ever since. John Jr’s wife Melani came up with the name for the restaurant. This is the place to go for traditional American fare for breakfast and lunch. John Sr. and John Jr. cook up their top seller, the Southern Skillet, and a favorite, the homemade biscuits and gravy–another family recipe. Pancakes and waffles are popular as well as the eggs benedict and French toast. When Jake decides to bake, he makes his famous cinnamon rolls, pies or cookies. Rise N Dine is open Tuesday through Sunday from 7 a.m. to 2 p.m. They extend their normal hours to celebrate with the town during local events such as the Old Car Festival. If you’re looking for a calm and comfortable atmosphere, hop into Rosewood Cafe, 118 S. Main St. in Vicksburg. 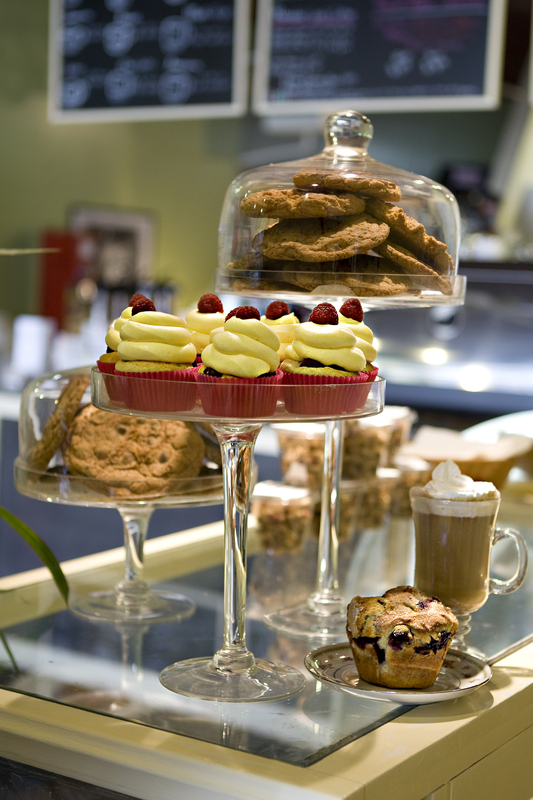 Sip your favorite beverage while enjoying freshly baked muffins, cookies and cupcakes. 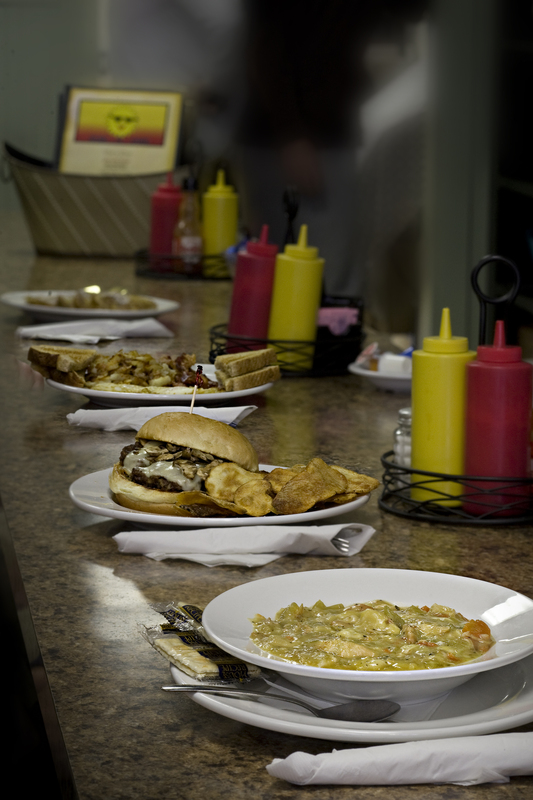 Or have the grilled breakfast sandwiches, quiche, soup, salads, sandwiches and wraps for lunch and dinner. Jill Lindsley opened the cafe in November, 2013, after owning and operating Rosewood Flowers for 16 years. The biggest draw to Rosewood Cafe is the coffee since the shop offers all kinds of coffee creations as well as selling coffee by the pound. The Coffee Club allows patrons to purchase a coffee cup and fill it with fresh brew every day for a small monthly fee. Punch cards also make it a value to get your coffee, coffee creations or smoothies at Rosewood. The head baker, Blair Gunberg, makes everything from scratch. Baked right on the premises are blueberry muffins, French vanilla and chocolate krinkle cookies, cupcakes. Fresh fruit is baked right in the muffin batter. Cupcake selections include raspberry with lemon frosting, topped with a fresh raspberry or strawberry with fresh strawberries blended into the frosting and a fresh strawberry on top. Other choices are the Hawaiian pineapple and coconut cupcakes, chocolate cupcakes for the chocolate lovers, and dark chocolate salted caramel cupcakes. Blair also makes soups and salads, using herbs grown in the front window of the cafe. While enjoying your coffee, you can browse the gifts and flowers at Rosewood Flowers, located in the same building. Soon Rosewood will introduce free delivery within the village limits with a minimum order of $20. To avoid the rush, Lindsley requests you place orders early in the day, or even the day before. Rosewood’s house are 7 a.m. to 6 p.m. Monday through Friday; 8 a.m. to 5 p.m. on Saturday and 9 a.m. to 2 p.m. on Sunday. They can be reached at 269- 475-5560. If you are looking for smokehouse meats, check out Stubby’s, 115 North Davis Street in Vicksburg. 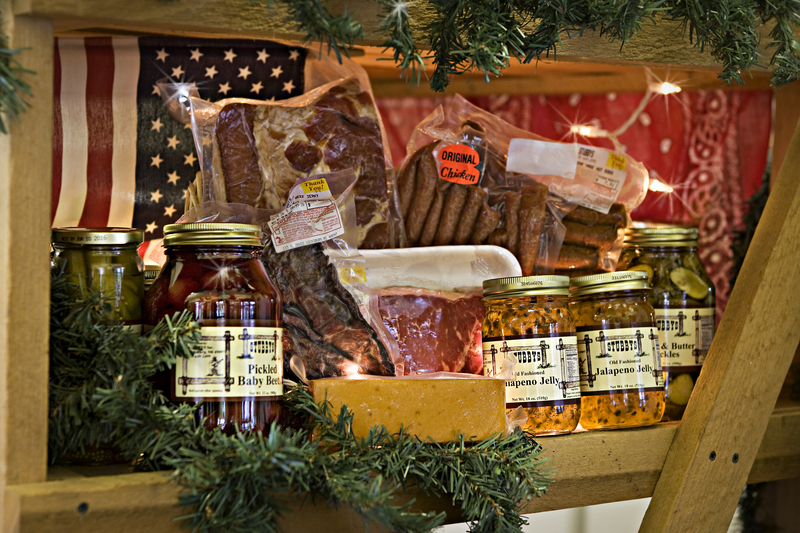 Stubby’s Jerky Smokehouse & Specialty Meats, a family-run smokehouse, produces smoked meats and cheeses. Owners Scott and Kelly Haynes had been perfecting the craft of smoked meats by making their own jerky for many years before opening the store in 2005. Stubby’s is known for its jerky which they have in an assortment of flavors in beef, turkey, chicken and pork. As a specialty meat market, they sell a full line of choice or better Angus including prime rib, filet mignon, New York Strip, and their top beef seller, the choice beef rib eye signature steak. Stubby’s also offers Grade A pork andMiller Poultry chicken. You can purchase whole chickens, or just boneless breasts. If you want their hot smoked turkey ready for Thanksgiving, get your name on the list early, because they always sell out. Stubby’s will cater parties up to about 400 people. Stubby’s phone number is 269-649-2499. Hours are Monday through Friday from 9 a.m. to 6 p.m. and Saturday from 9 a.m. to 5 p.m. They are closed on Sunday. Pictured is the shrimp taco, with grilled shrimp, avocado, shredded carrot and cabbage, cilantro and pico de gallo. 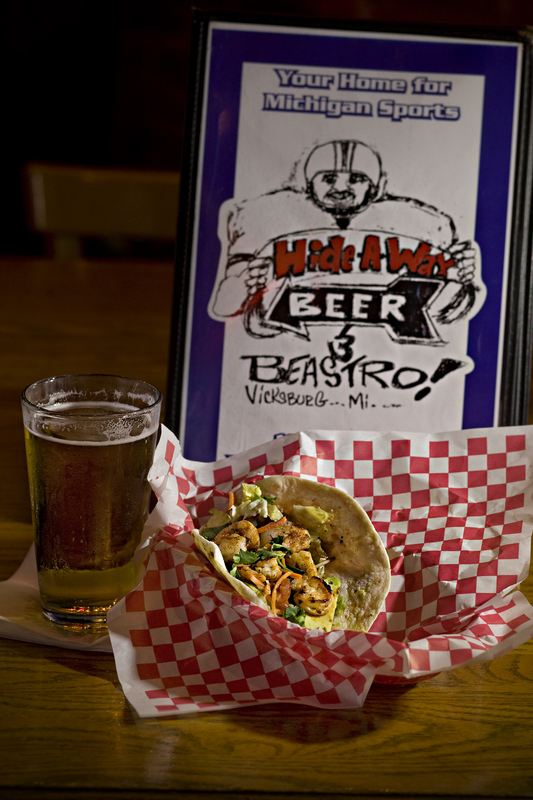 The Hide-A-Way, 111 E. Prairie, is an aptly named local tavern that was first established in Vicksburg in the 50’s, truly a hidden gem in Kalamazoo County. The lite “Beer” sign over the door announces its existence, but if you’re not paying attention, you just might miss it. Locals love it, and out-of-towners rave about how they would drive to Vicksburg just to go to the Hide-A-Way for burgers. The tavern is owned by Scott Plankenhorn who purchased it from his father in 1999. He remodeled the space in 2002, stripping the barn wood walls down to the natural brick, paneling with tongue and groove wood and installing a new kitchen. In 2010 the restaurant, along with all Michigan restaurants, became non-smoking, bringing in a new clientele by way of families; and business increased 40 percent. The full bar features Michigan beer on draft, such as Latitude, Bell’s and Gonzo’s Big Dog Brewery. Aside from the famous burgers, some of the biggest sellers are the reuben sandwiches and perch baskets. In fact, the reuben is reported to be the best reuben in Southwest Michigan, if not the world. Scott, a Vicksburg native, is active in the village. He has sponsored many Little League and Rocket football teams, and many of those kids and their families stop by the Hide-A-Way after games. Scott gives a lot of credit to his staff at the Hide-A-Way. They take care of the place and run it like it’s their own, he said. The friendly camaraderie makes it a good place to eat and a happy place to hang out. The Hide-A-Way’s phone number is 269-649-3134. Regular hours are Monday through Wednesday from 11 a.m. to midnight; Thursday through Saturday from 11 a.m. to 2 a.m.; and Sunday from noon to 10 p.m.